Imagine being a Knight locked in a fierce sword battle or a Lady letting an arrow fly to hit the mark. One of the ways that a classical education helps students love learning is by bringing history to life. 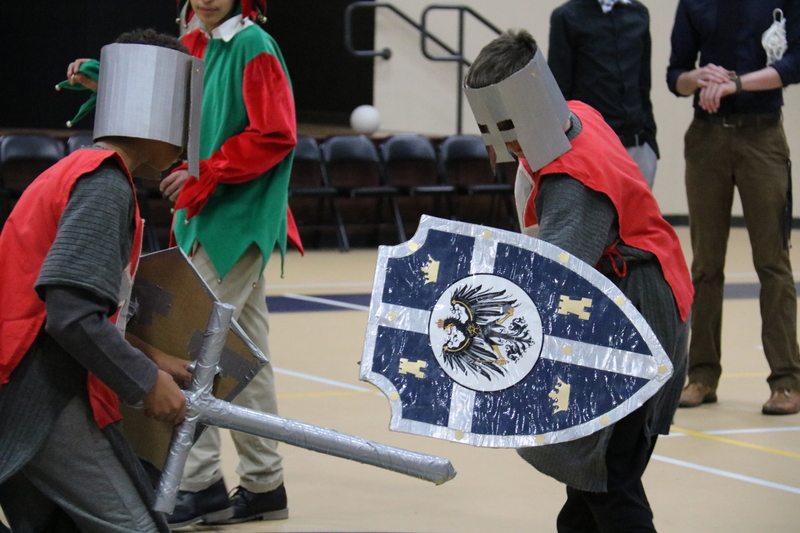 Each year our fourth and ninth grade students step back into history and enjoy an exciting Medieval Feast and tournament. This event brings to life many traditions and experiences that define the Middle Ages. 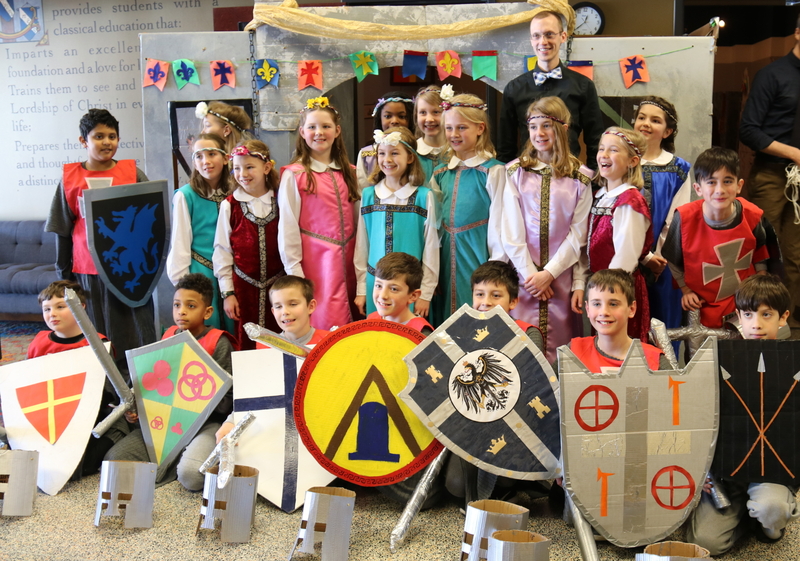 For weeks (possibly years), the fourth grade students have anticipated the day of the great sword fight or getting dressed up as a Lady or a Knight. We asked Nate Grim, our fourth grade teacher, to share about this exciting experience. What is the Medieval Feast? Why does it involve fourth and ninth grade specifically? 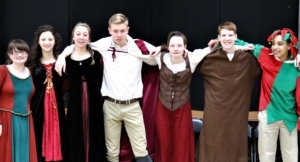 The Medieval Feast is an attempt to create an authentic experience of the Middle Ages for both fourth and ninth grades. 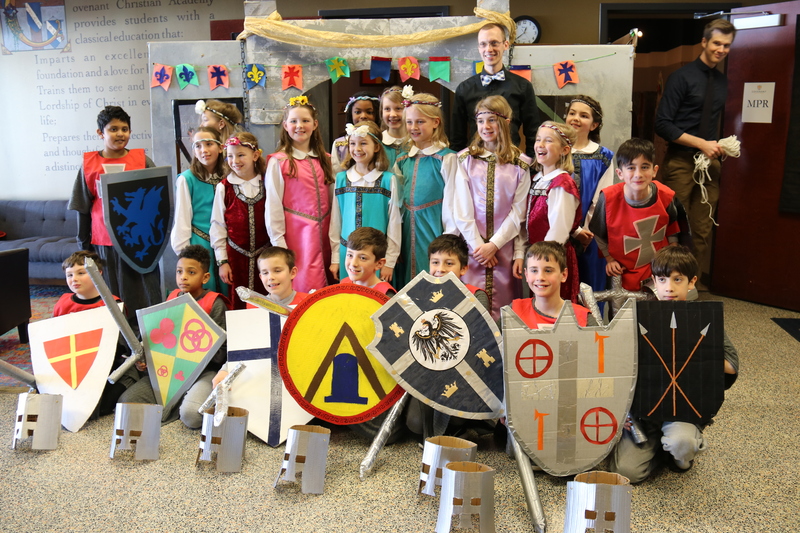 The students and parents prepare food, skits, decorations (complete with castle pieces and a drawbridge), artwork, games, and musical performances that relate to medieval times. At Covenant, the Grammar School studies history chronologically from second grade through sixth grade. Then, the cycle repeats with more detail in seventh grade and continues through Upper School. Medieval history lines up with fourth and ninth grades. Can you walk us through the series of events that take place during the Medieval Feast? The feast begins shortly before noon with the entrance of the fourth graders into the royal court, which the ninth graders have created. The ninth graders are the hosts, so they choose a historical leader, such as King Richard, Alfred the Great, or Charlemagne. Upon arrival, the ladies are shown to their seats, and the fourth grade squires are dubbed knights. The ninth graders follow a script and schedule of events they created prior to the feast. 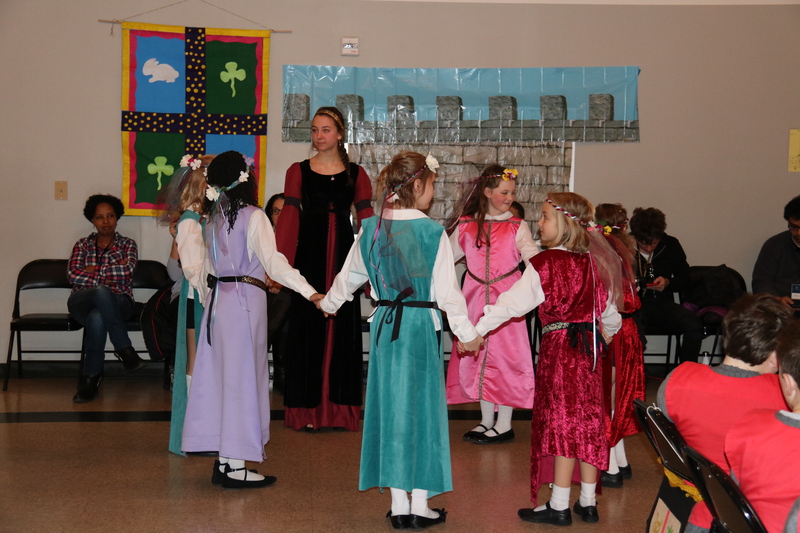 After handwashing and a traditional Latin prayer, the students are served authentic medieval finger foods, drinks, and desserts by the parents. The guests also get to throw a chicken bone to the castle dog. During the feasting, the entertainment begins. A beggar or jester often makes an appearance as well as madrigal singers (the chamber choir), instrumentalists, and actors. Each ninth grade class does its own version of events. After much revelry in the dim, castle-themed cafeteria, the ladies slip on their sneakers and the boys lower their helmet visors and grab their shields and swords. The students head to the gym where the ninth grade has prepared various activities. 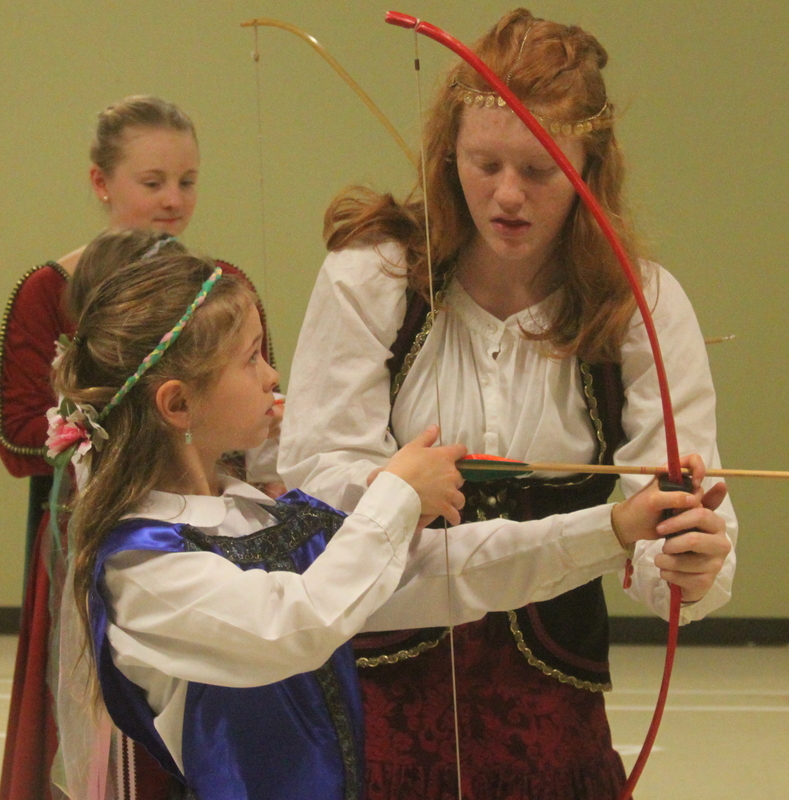 Traditional activities include, a maypole dance, sword fighting (with swords made from wrapping paper rolls and duct tape), archery, and tug-of-war, but the ninth grade chooses which activities to include. What kind of preparation goes into this event? The fourth grade creates a tapestry each year for the feast, so they have the opportunity to thread a needle and do some sewing. In the past, some classes have sewn large tapestries imitating the Bayeux Tapestry or a Scandinavian rune stone, while others have created smaller personal-sized tapestries at home. Preparations for the feast begin in December when I ask the students to begin collecting empty wrapping paper rolls to use for the swords. 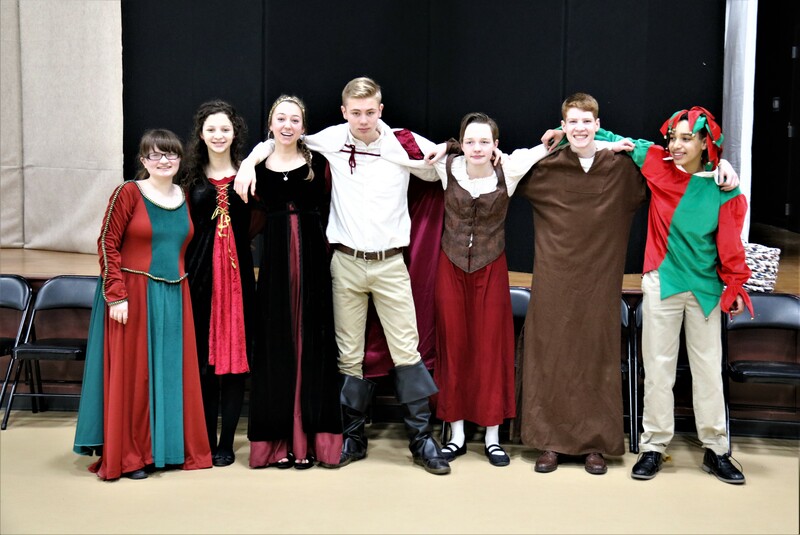 Throughout January and February, parents and students prepare the tapestries, skits, musical selections, menu, décor, games, costumes, shields, swords, helmets, and hair dresses. I think the suspense about kills the students and parents, especially when snow delays or cancellations threaten the feast. Can you expand on the interaction you see between the older and younger students? Sometimes the ninth grade girls use recess time to teach a dance to the fourth grade girls, which is then performed as entertainment during the feast. The games, led by the ninth graders, often involve interaction between the two grades – especially tug-of-war. The interaction includes both loving guidance from the ninth graders as well as some healthy competition! 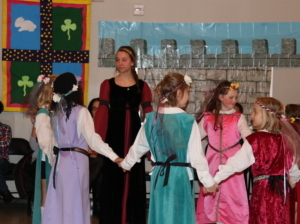 After the feast concludes, the fourth graders dream about being the king, queen, or jester in ninth grade. *Special thanks to Mr. Grim for contributing to this blog post! If you’d like more information about Covenant or would like to schedule a tour, please contact our Admissions Director at Katie.Broeg@DiscoverCovenant.com or 717.540.9885 ext. 555. You can also fill out the form below.